Real whipped cream is light yet creamy, soft yet rich, and easy to dollop onto pies and cakes and ice cream. Sure, you can buy something labeled whipped cream in a can or a plastic tub, but it isn't real cream (read the ingredients!). It takes just the tiniest bit of effort to make and serve real whipped cream, and the rich flavor and wonderful texture of real cream really are worth it. Use these tips to make sure your cream whips up as quickly and lightly as possible. Start with chilled heavy cream. Cold cream whips up the quickest and lightest; chilling the bowl and whisk or beaters for at least 15 minutes before whipping the cream will speed things along, too. Start slowly whisking, whipping, or beating the cream. Going a bit slowly now will limit the amount of splattering. Add sugar or flavorings once the cream starts to thicken up a bit. About 1 teaspoon sugar to each 1/4 to 1/2 cup of cream use (or more to taste), if you want sweetened cream. You can also add 1/4 teaspoon vanilla extract to each 1/2 to 1 cup cream for vanilla-scented whipped cream (a.k.a. chantilly cream) if you like. Increase the speed once any sugar or vanilla is incorporated into the cream. Whip, whisk, or beat the cream until it forms soft peaks. What are soft peaks? 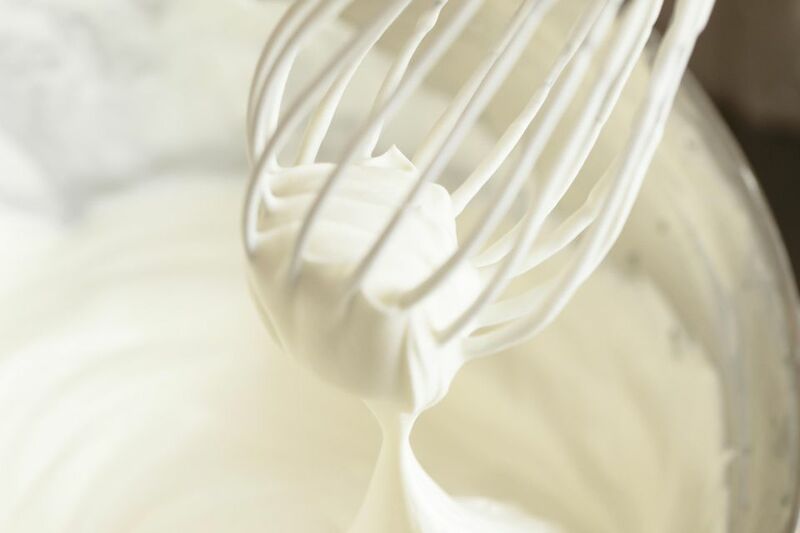 When the whisk or beaters are removed from the cream, a soft peak should form in the cream, but the peak should drop to the side, not hold its shape entirely. Avoid over-whipping the cream. Softly whipped cream dollops nicely and maintains a smooth, creamy texture; cream beaten to stiff peaks starts getting a slightly grainy texture and can quickly separate into butter and buttermilk if over-beaten. Whipped cream is delicious right after being whipped, but it can also be covered and chilled for up to 24 hours without too much ill effect, so feel free to whip the cream before guests show up. Some people recommend using powdered sugar or confectioners' sugar to sweetened and stabilize whipped cream that is going to sit a bit, although I've never found that cream that isn't over-beaten needs stabilizing. Note: Ultra-pasteurized heavy cream is much trickier to whip, but it can be done. Make sure it is super cold and use well-chilled bowls and beaters; it should whip up just fine, it just may take a few more minutes than regular pasteurized heavy cream.